Are You in Danger From Too Much Medical Radiation? The amount of radiation being used on patients for medical diagnosis and treatment purposes has been called into question in recent years. While few experts doubt the sometimes life-saving benefits of the right use of radiation at the right time, others point out that its overuse can be dangerous for patients. Like anything good and useful, there must be balance in how radiation is used. Smart patients understand what radiation is, how it is used medically, the risks and rewards, and the benefits and dangers of using radiation for their medical care. Radiation is a form of energy that occurs naturally and may be harnessed to use more intentionally. Radiation is not unlike electricity, which occurs naturally in the form of lightning or static electricity, but can be harnessed to run equipment or just to turn on the lights. Depending on how electricity is used, it can be very helpful, or it can kill us from overexposure. The same is true for radiation. We are exposed to trace amounts of radiation through naturally-occurring avenues such as sunshine, soil, rocks, water, and air. Very low levels of radiation are transmitted through everyday man-made objects like TVs and radios, cell phones, automatic garage door openers, microwave ovens — anything that relies on certain types of radio waves to work. Much larger and more dangerous amounts of radiation are generated by objects such as nuclear power plants or medical equipment used for imaging and treatment. How Is Radiation Used for Medical Purposes? Think back over your lifetime of medical care. Have you ever had a CT ("cat" — computed tomography) scan, a PET scan (positron emission tomography), or even an x-ray? All three use radiation to help diagnose medical problems. You may know them by other names, too. Mammograms use radiation to diagnose breast cancer. DXA (DEXA) scans use X-rays to diagnose osteoporosis. In addition to diagnostics, radiation is a tool for medical treatment, too. Breast cancer, prostate cancer, lung cancer and other cancers may be treated with radiation therapy in an attempt to shrink or destroy tumors or other cancerous cells. Radiation oncology is the term used to describe this form of treatment. For cancer treatments, a very specific, targeted beam of radiation is pointed at cancerous problem spots, and radiation energy is then used to kill the bad cells and destroy those tumors. Because it can be so well-targeted, the healthy cells in surrounding areas will be spared. The various radiation-based medical tests like CT scans are not as targeted. They produce images that are broader, covering both healthy and cancer-damaged tissues and organs. How Much Is Too Much Radiation Exposure? When it comes to medical applications, there don't seem to be specific guidelines that tell us how much radiation is too much. Further, a definition of "too much" could vary from patient to patient. For example, the patient who receives accurately targeted radiation therapy to destroy a tumor will get much higher doses than someone who gets a CT scan. That amount of exposure is just right for the cancer patient at that moment, but if a healthy person was exposed to that much radiation in general, it could be too much. At an extreme, medical overdoses are called radiation poisoning or acute radiation syndrome. A combination of the amount and frequency of exposure, part of the body, and period of time are the factors that help define whether there has been overexposure. So, for example, several dozen mammograms over a lifetime may not be problematic, while a dozen scans in a year could overexpose a patient. In some cases, "too much" is a result of errors. Those high doses being used for radiation oncology purposes can be harmful if the beam isn't accurately targeted. Patients may overdose when radiation testing equipment has not been correctly calibrated, or when a human being makes a mistake inputting dosage settings. Money may be a factor, too. In profit-driven medical systems, or where defensive medicine is practiced, studies show that patients are given more of these radiation-based tests than in areas where those aren't factors. Those extra tests could cause overexposure to radiation. Too much exposure to radiation causes both short- and long-term problems. When the body is over-radiated, then healthy cells and tissues are destroyed. There may be symptoms that appear within a short time after overexposure (hours or days) such as nausea, vomiting, diarrhea, fainting, hair loss, skin burns or flaking skin, hair loss and others. Too much exposure to radiation over a period of time can lead to chronic illnesses such as cancer, eventually resulting in death. One study showed that 15,000 Americans die each year from radiation exposure during their lifetimes from natural and other sources. That same study showed that most doctors, including radiologists, do not understand the dangers of overexposure to radiation. Extreme overexposure all at one time (which can happen when machinery malfunctions) can cause death. First, assess risk vs reward. You can often make this assessment through a conversation with your doctor. For example, when it comes to cancer treatment, the destruction or reduction in the size of a tumor will likely be worth the risk of the radiation load. 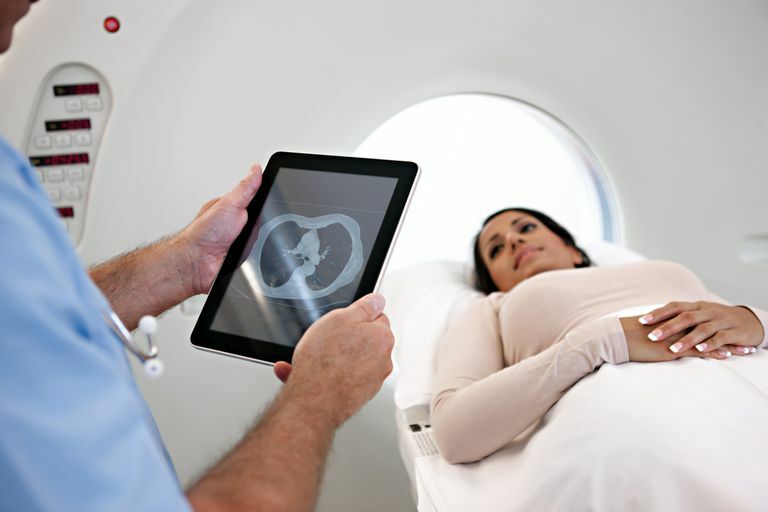 However, if you decide to get a second or third opinion about your diagnosis, and each doctor insists on running his or her own CT scan rather than simply reading the one you've already had, then the exposure may be unnecessary. Discuss your concerns with your doctor to determine whether there is an acceptable alternative. If you are pregnant or suspect you might be pregnant, be sure to mention that to your doctor. Exposure during pregnancy may be harmful to your baby. If you will undergo radiation therapy for cancer, then it can be useful to ask your oncologist what dose will be used, then ask the technician to confirm that dosage, just to compare notes. If the answers aren't the same, then ask someone to double-check. When you will be getting a radiation-source medical test, ask that they cover the parts of your body not being tested. A good example is a way your dentist covers your torso and stomach prior to taking an x-ray of your teeth. Keep track of all your medical tests, especially radiation-type tests like X-rays, CT scans, and PET scans. (Note — MRIs do not use radiation, but it's smart to track them, too.) Make a list that includes the date of the test, the type of test, and what was being tested. The next time a doctor orders one of those tests for you, show him or her the list and ask whether there is an alternative test to prevent overexposure to radiation. The Verywell Colon Cancer Expert has put together information about radiation levels. Apps are available, for example, there's an application called Radiation Passport.